A songwriter worth his weight and then some in gold, Pete Krebs proves once again on Hot Ginger and Dynamite to be one of the most versatile songwriters today. Capable of bashing out the hard-edged power-pop as he did in his early 90's quartet Hazel, the rock-inspired bluegrass of Golden Delicious, folk songs, straight ahead pop, and now Django Reinhardt-esque 30's and 40's jazz. 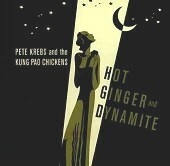 Krebs and his band, the Kung Pao Chickens, work their magic on the classics, delivering a knockout, if not a devilish performance time and time again, breathing new life into old standards. From the acoustic "Swingin' With Django" (Django Reinhardt/Stephane Grappelli) to the swinging "Blue Skies" (Irving Berlin), there seems to be nothing Krebs and company can't handle.